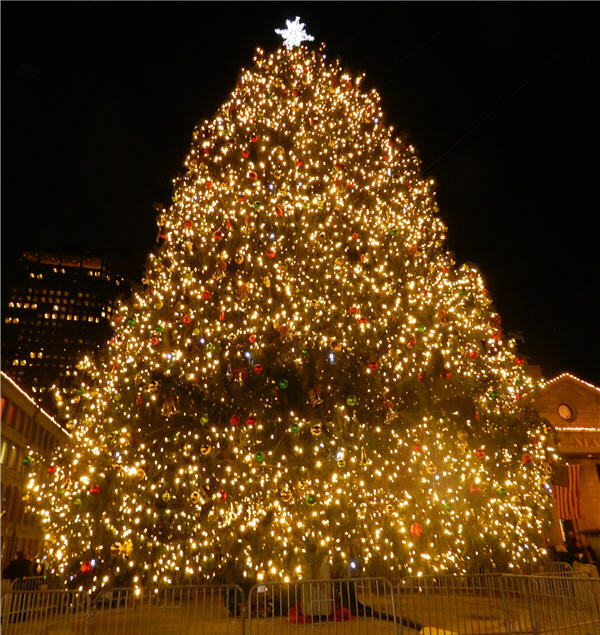 Besides putting up your own Christmas Tree there is nothing like going to one of the many Christmas Tree Lighting events in the Boston area. Even if you don’t get a chance to go the tree lighting events themselves making it a point of visiting at night is a must for the Holiday season. My family and I went into Boston Thanksgiving Weekend to see what was happening and it proved to be quite the memorable experience. The kids love going to the Hard Rock Cafe when we are in the area and that was a great way to start our night out. If you are tight on time though keep in mind that when the Celtics are playing many restaurants fill up pretty early for dinner. Boston at night is quite pretty and the weather on that Saturday was quite mild. So mild in fact that we even walked over to the Boston Waterfront next to Tia’s to look at their wonderful lights as well. My husband and I actually were at Faneuil Hall a week earlier and caught the end of the Christmas Tree lighting ceremonies. The new experience this year that is definitely worth experiencing yourself is the Blink experience. The trees lining the middle of Faneuil Hall and the trees in front of it as well are lit up. The trees in the middle actually light up in a timed way that is very neat to watch. You can get more details on Blink events that start nightly at 4:30 pm at BostonBlinks.com. Tonight the Boston Common Tree lighting is taking place. Sadly Mayor Menino will not be able to participate in the event but you will be able to catch 2 singing performances from Elliot Yamin of “American Idol” fame and James Massone who was a contestant on the other singing competition show “The Voice”. There will be other performances which will include an appearance by the Grinch. Dress warmly since we still are in the cold snap. The good news here is that the Frog Pond will be able to comfortably put on the Frog Pond Skating Spectacular which is part of the annual Boston Common Tree Lighting night. The tree lighting will be covered by WCVB Channel 5 starting at 7pm if you can’t make it. The big Christmas tree lighting events besides the one on the Boston Common that come to mind in Boston are the Macy’s Tree Lighting, the Faneuil Hall Tree Lighting and the Prudential Tree Lighting. The first 2 are already lighted and sadly it seems I am dating myself when it comes to the Prudential. The used to have a tree lighting but now do have other events including Santa appearances and the lighting of the Prudential Tower itself in different colors to support different causes. The City of Boston has also come out with a list of many neighborhood Holiday related events including tree lightings. The Boston Holiday event guide can be downloaded here. Enjoy this beautiful time that is more than just about shopping!